In this section, we’ll look at five of our favorite portable gas grills for camping. We’ll consider the positives and negatives of each, and pick our favorite. 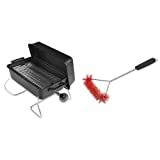 The Cuisinart CGG-180T Portable Tabletop Gas Grill is a great choice for a camping grill. It has a cute, futuristic design that makes it look like a mini Mars rover or space robot. It comes in two colors, and though a stand for the unit is available, there is no option for a stand with rollers. The unit features a 145″ porcelain-enameled cast iron grilling surface and a 5500BTU stainless steel gas burner which can quickly heat the grill to more than 500’F. The aluminum fold-away legs and stabilizing feet set up in seconds, and the CGG-180T has a nice lid locking feature to ensure that the unit stays closed during transport. The CGG-180T Petite Gourmet gas grill has a large cooking surface, and can easily accommodate 8 burgers, 8 steaks, 6-10 chicken breasts, or 4lbs of fish at once, making it capable of feeding the gang quickly and efficiently. It is designed to take 14.1oz and 16.4oz LP gas containers (not included) and can be adapted to accept 20oz LP-gas containers with the purchase of an additional adaptor hose. The Coleman RoadTrip 285 Portable Gas Grill is a fine entry into the portable gas grill for camping space. It is sleek and attractive, with interesting rounded edges and a great deal of style. The grill has a large, easy to clean porcelain-enameled cast iron cooking surface, clocking in at 285″. It’s capable of handling a whole lot of hot dogs! The RoadTrip 285 features a dual burner setup with each burner putting out 10,000BTU of cooking power, for a total of 20,000 BTU of heat available. The unit features a pressure control system which helps even out the temperature fluctuations in windy and cold environments, a nice feature for those chefs who seek fine temperature control. The Road Trip does include a stand and rollers, making it very convenient to move around and set up on the campsite or at the beach. It is designed to connect to 16.4oz LE Propane cylinders, not included. The Coleman Road Trip 285 is the best portable gas grill for camping. 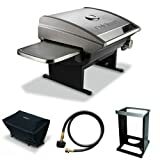 The Cuisinart CGG-240 All Foods Roll-Away Gas Grill is a great unit, with several unique functions that make it an attractive choice for today’s on-the-go family. It is portable, making it ideal for camping, tailgating, beach use, or for families with small outdoor spaces that need every square foot to count! This grill has a 240″ cast iron grill surface with a 15,000BTU gas burner, easy-start pilot light system and temperature gauge, and also includes a pair of stainless steel folding tables with large wheels for easy transport. The Cuisinart CGG-240 is a great choice for the chef on the go, with its sleek stainless steel construction and modern design. The roll-away cart makes this piece very easy to move from one location to the next. It is designed to take 14.1oz and 16.4oz LP gas containers (not included), but will also work with 20lb tanks when the optional adaptor hose is hooked up. The Weber Q1200 Portable Gas Grill is an excellent choice for the Chef-on-the-go, with several impressive features and a compact footprint. The Q1200 is a tabletop grill and does not include a stand or a wheel system, but it does include two large side tables for a pleasant cooking experience. As an added feature, there is an optional stand attachment, which can be purchased here. The unit features a large 189 square inch porcelain-enameled cast iron cooking surface, and an 8500BTU gas grill element. The exterior of the Q1200 is made of cast aluminum, and as a nice bonus, it comes in a wide array of colors. It has an easy-start pilot light system but does not include a temperature gauge. The unit runs on either 14.1oz or 16.4oz LP cylinders, which are not included. The Q1200 is a great choice for camping, tailgating, or beach celebrations, and is sure to handle all the burgers and dogs needed to satisfy a hungry family! As a nice bonus, it is fully assembled out of the box. Simple, utilitarian, and FAR cheaper than the other options on this list! The CharBroil TableTop Gas Grill may not have much in the way of aesthetics and options, but it has an amazing set of features for the price. The unit features a chrome-plated 184″ cooking surface and an 11,000BTU LE Propane burner for rapid cooking ability. This unit is made with steel construction and a high temperature finish to help prevent rust and damage to the exterior. It has fold-away metal legs that fold over to the top of the grill, which locks the grill in place: an effective design feature. It also includes heat-resistant handles, enabling users to move the grill even if it’s still warm. The CharBroil TableTop Gas Grill is designed to work with 14.1 or 16.4oz LP Gas Tanks, which are not included. All of the grills on our list are well built and will cook a mean burger. But the clear standout is the Coleman Roadtrip 285. With its large, two-burner design and combined 20,000 BTU heat output, this grill hits a great size configuration. Also, the stand is integrated with the grill and does not need to be purchased separately. This design makes the Coleman the best camping gas grill around.